African Land Forces Summit holds in Abuja, the nation’s capital on Monday. The summit, co-hosted by the United States of America, gathers top military chiefs from various African countries to confront the existing terrorism threats in the continent. Military top brass from across Africa on Monday kicked off a conference co-hosted by the United States aimed at boosting cooperation between countries fighting extremist groups. 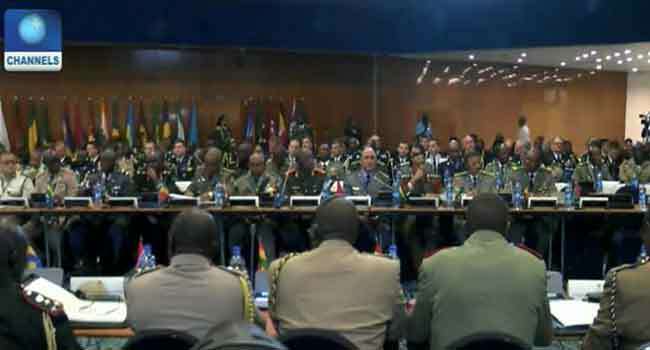 The African Land Forces Summit brings together “land force chiefs from across Africa for candid dialogue” to improve security, said the US Army in an April 10 statement. Military leaders from almost every country on the continent — including Angola, Cameroon, Egypt, Kenya and Rwanda — were in Abuja, the state capital to exchange notes on threats in Africa, from Al-Shabaab in the east to Boko Haram in the west. President Donald Trump has continued to prioritise security on the continent. Before he was sacked in March, Secretary of State Rex Tillerson had just completed a five-country tour of Africa, pledging military assistance. The Sahel region is host to Al-Qaeda in the Islamic Maghreb (AQIM) in Mali and Boko Haram in Nigeria. US forces are stationed in neighbouring Niger, where last November the government gave the green light to arm drones to fight jihadists.